Join your friends and family on our stable J-rig pontoon boats for a wonderful adventure visiting Canyonlands National Park. 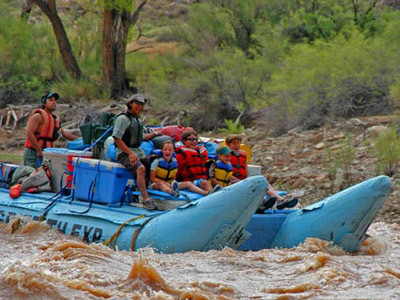 We begin this Colorado River rafting trip by meeting the guides on the first day and getting comfortable on motorized rafts that quietly whisk us through the stunning scenery and gentle waters of the first stretch of river. Relax and connect with interesting people as you take in a different view around every bend. Visiting Canyonlands National Park by way of the river is the best way to see it. 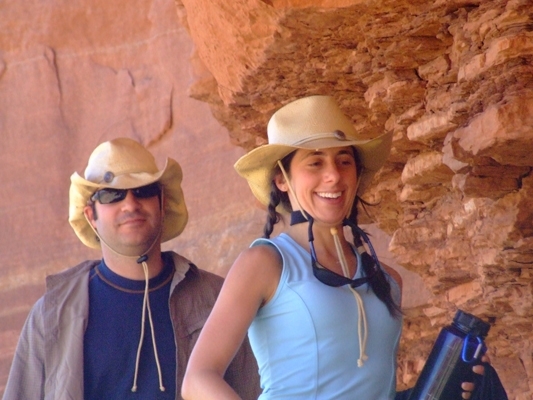 No crowds and stunning beauty surround you on this Moab rafting adventure! 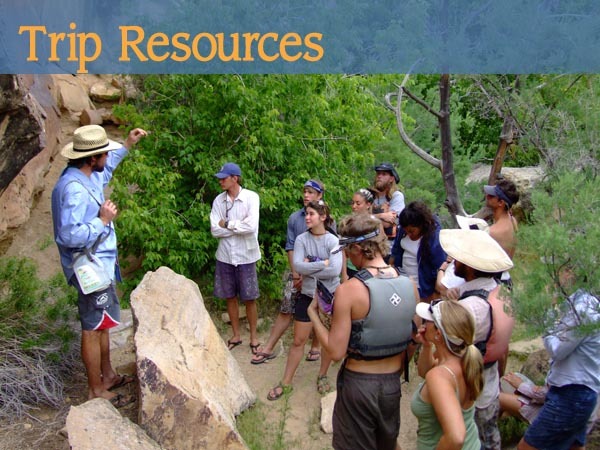 The second day there is time for a loop hike if you choose — a guide leads hikers around one of the canyon’s famous “gooseneck” twists and the rafts meet everyone downstream. 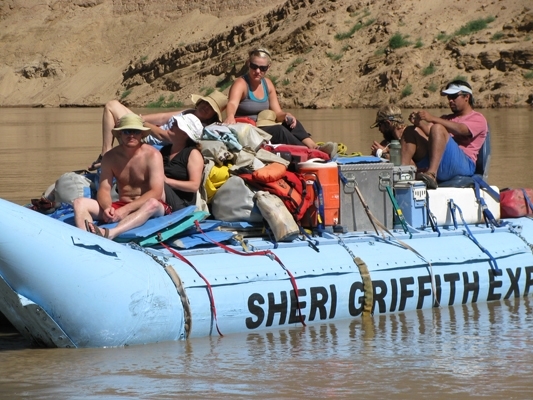 Later the second day we’ll float into the confluence — where the Green and Colorado rivers meet — and face gigantic waves downstream. J-rig pontoon boats are larger than traditional rafts, offering more security to those concerned about Colorado River rafting’s mighty whitewater. Sit up front or take a seat in the middle as we descend Capsize, North Sea’s, Little Niagara, Satan’s Gut, Ben Hurt and the famous Big Drops rapids. It’s an exciting day full of thrills and smiles! Camp a second night under the stars and motor the final day onto Lake Powell. 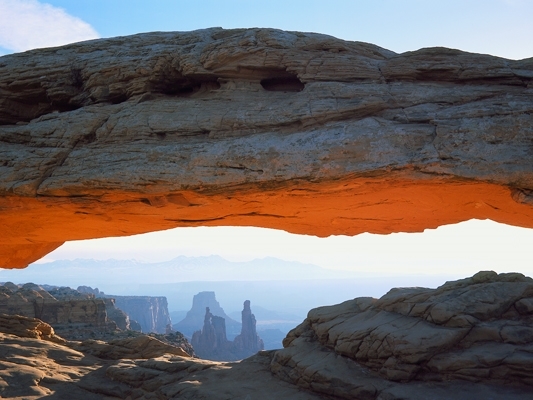 Complete your adventure with a scenic flight over Canyonlands National Park and its stunning landscapes. 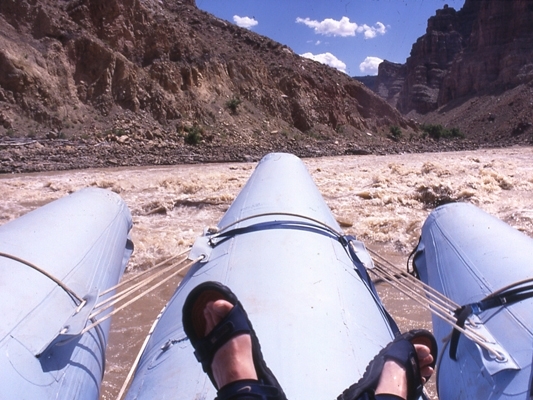 A classic Moab whitewater rafting experience! This entire 3-day journey is done in J-rig boats, allowing a slightly slower pace than the 2-Day Highlights of Cataract Canyon trip that starts in a jet boat. There’s time for a short hike or two in the amazing side canyons of the park. The 4-Day Highlights of Cataract Canyon allows time for daily hikes and a deeper immersion into the river’s way of life. This 4-day option in J-rigs is similar to our popular 5-Day Sights of Cataract Canyon trip in oar boats, yet J-rigs are more stable . We settle into the boats and begin our journey down river through the heart of Canyonlands National Park. This morning we may visit the petrified wood bed and will pass the Pyramid Butte. We will also pass Tex's Grotto, where a Grand Piano is set up for concerts during the Moab Music Festival, and Dead Horse Point, where the movies Mission Impossible 2 and Thelma and Louise were filmed. We will pass Lockhart Canyon, where Butch Cassidy and the Sundance Kid used to hide their stolen cattle until they could move them to market. We will also see Indian Ruins at Lathrup Canyon. Enjoy a delicious lunch riverside on one of the may beautiful beaches. The canyon walls are a beautiful, deep red which contrasts beautifully with the pristine blue sky that will be your ceiling for the next 3 days. As we stop for the evening we will reach the Confluence of the Green and Colorado Rivers. We now enter the true heart of Canyonlands National Park as we near the Confluence. If it has rained recently, the mixing of the rivers will be defined in brilliant swirls of red and green. We will pull off the river to camp for the night. After setting up your tent, you can sit back and relax or hike the canyons while the guides set up chairs and the kitchen. Swimming is also an option. Dinner is prepared for you by your river guides. Meals are wonderful combinations that fit well into the atmosphere of your canyon dining room. Vegetarian options are available with advance notice. This morning we will experience the first of the Cataract Canyon rapids, numbers 1 through 10. By now the river has doubled in size and force. The rapids start small, but soon evolve into some of the biggest whitewater in the Western United States (on trips during May and June, later season trips ~July and August~ have smaller rapids). Rapids whose names are almost as intimidating as the whitewater itself: Big Drop 2, North Seas and Capsize. Everyone will be thoroughly soaked as we take a break at midday for lunch and to catch our breath. Stop for Lunch and for some "Land Time". 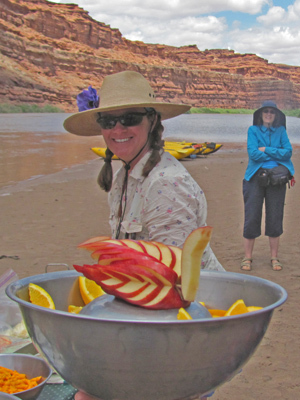 While the guides prepare lunch, you are welcome to explore the canyon a bit or watch as others run the big rapids you have just been through. Once we have finished with lunch, we get back on the boats and head into the big whitewater. This afternoon we will navigate through more intimidating rapids, including Big Drop 3, Satan's Gut and Little Niagara. There may be stops along the way as the guide scouts the rapids to find the best route through the churning whitewater. We will pull off the river. After we recreate our riverside oasis, you are welcome to kick back, relax and relive the day's adventures over and over again as the evening deepens and a bright canopy of stars replaces the blue sky. This morning we will pass through the final rapids. We may have some opportunities for hiking in some of the canyons previously lost to Lake Powell's waters, but accessible now that the waters in the lake have dropped. 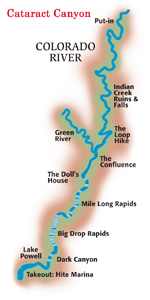 Clearwater Canyon and Dark Canyon are guide favorites. We'll stop for a final meal and possibly for a quick hike. 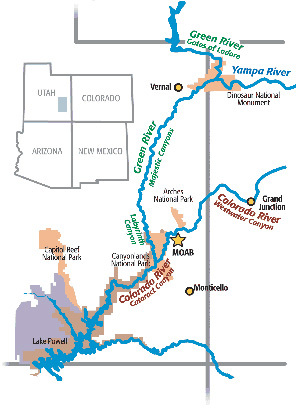 We'll climb back aboard the boats and follow the Colorado River as it pushes its way into the calm waters of Lake Powell. Here we'll be in the deepest part of the canyon, surrounded by nearly 2,000 foot cliffs. We'll see the Dirty Devil River and Piano Leg Arch. We'll motor off of the lake and pull off near what used to be the Hite Marina on Lake Powell. You will be escorted to the landing strip for your return flight to Moab. As you take this scenic flight, watch for the Henry Mountains, the White Rim, the Abajo Mountains, the La Sal Mountains and nearly the entire Colorado Plateau. You will bet met at the Moab airport and transferred back to Moab and the Sheri Griffith Expeditions office where your journey ends. 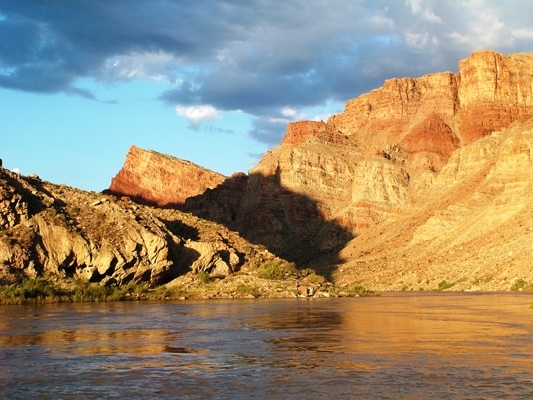 Colorado River has form lots of amazing geological wonders. Canyonlands National Park has some wonderful views. 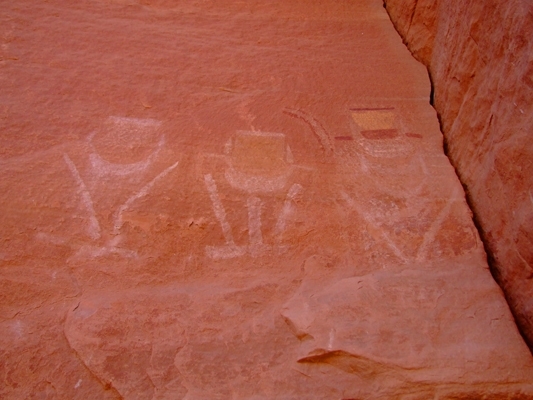 1000 year old Anasazi Indian writing are one of may very cool stops along this stretch of the Colorado river. Lots of room on our Jrigs through Cataract Canyon. Stable and larger Jrigs ride great in Cataract Canyons larger whitewater.